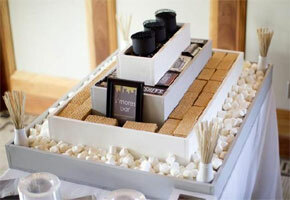 Home / Decorating Ideas / HOW-TO: Make Your Own S’mores Bar at a Wedding! S’mores! The name of this super-popular treat says it all. The party world, and now the wedding world as well, can’t seem to get enough of it’s chocolatey, gooey goodness. And one aspect of this S’mores love affair we’re crazy about is a make-your-own S’mores bar at both outdoor and indoor wedding events! 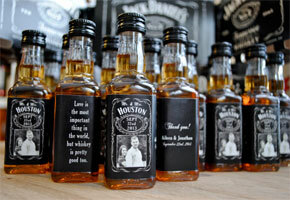 Want to see how to put together a bar like this at your own wedding? It’s actually a breeze, as these tips and images below will show! 2. Have ‘assembly’ supplies ready. – Have barbecue sticks, mini wooden skewers, toothpicks, tongs, and lots of paper towels on hand to make your guests S’mores ‘assembly’ and eating as easy and mess-free as possible! 3. Choose your serving option. – Arrange the ingredients and supplies on trays on a table set up at your outdoor or indoor reception. A fun option we noticed is having a ‘starter set’ (a box with a couple of graham crackers, marshmallows, and chocolate bars) waiting on each guest’s place setting. Great way to get the grilling going! 4. Fire up the grill or light up the campfire. – If you’re lucky enough to have an outdoor venue where you can build an actual wood fire, that would be fantastic! But for an indoor reception, there’s always the clever alternative of having a table-top grill at the center of your S’mores bar or else individual hibachis (Japanese cylindrical grills) for guests to use as well. Ask your caterer about these. 5. Indulge in fancier ingredients! – Now, if you wish, here’s where you can get real creative and indulge a little (or a lot)! Add fancier varieties of chocolate bars to the spread of ingredients—maybe some with peanut or almond butter, mint, or liqueur. Offer dried fruits, raisins, chopped nuts, toasted coconut, sliced strawberries, maraschino cherries, blueberries, or cranberries. For topping choices, you could have Nutella, peanut butter, cinnamon powder, nutmeg, crushed peppermint, and even candy sprinkles! LOOKING FOR MORE DIY WEDDING IDEAS? Hot Cocoa Favors for Weddings: How to Package Them Pretty! Just writing this post has got us craving S’mores ourselves! Hope it has gotten you ‘fired up’ to build your own bar—and make your reception one that your guests will surely remember! Got your own ideas to share? Leave a comment! Previous Head off to the Kitchen: Homemade Favor Ideas! Next Bridal Looks for Fall with Chic Plum and Purple! This has to be one of the yummier ideas I’ve seen out there. The chocolates are to die for!